From NYCHA’s $17 billion repair backlog to the deficit of rental assistance in a city with soaring housing costs, New Yorkers have long suffered from the federal government’s reduced spending on housing, which remains far below pre-Reagan era levels. In the country as a whole, the unmet needs are momentous, with only one fourth of eligible low-income households receiving the rental assistance they need to afford a home. And just as we would seem to need it most—with discussions in rezoning neighborhoods often revolving around the question of how much subsidy is available to help low-income households remain in their neighborhoods—many housing and tenant advocates fear that things are about to get a whole lot worse. The president-elect is a real-estate developer with a track record in New York City of discriminating against black tenants and trying to flout affordable housing laws; he has nominated a former Wall Street bank chair for Treasury secretary, and appointed a private equity CEO as a top adviser. Some housing advocates are hoping there may be opportunities to influence the incoming administration in their favor. The National Low Income Housing Coalition (NLIHC), which includes New York groups like Tenants and Neighbors and Supportive Housing Network of New York, sent a letter to the president-elect urging him to invest in housing as part of his plan to rebuild America’s infrastructure. Some have also expressed hope that Ben Carson, Trump’s nominee for the Department of Housing and Urban Development (HUD), might be open to persuasion given his lack of clear policy stances—and seeming desire to please everyone—at last week’s hearing. James Saucedo, a NLIHC organizer, says the coalition will focus its energy on making the case to Republicans that housing affordability and poverty are crucial issues for every district in the country. “It would be short-sighted and it would be a failure for the people that we care about to not be willing to work with them,” he says. Others say they expect only complete austerity from the feds, but hope the threat of Trump will galvanize local governments to more seriously address housing issues using their own budgets. In the online journal Metropolitiques, CUNY professor John Krinsky says that for Cuomo and de Blasio to live up to their progressive credentials, they must “[address] themselves seriously to what will happen once the federal government stops supporting public housing and cuts back on vouchers.” To Krinsky, that means ending the 421-a tax break, which the city says promotes rental housing construction but which Krinsky argues could be used to fund more than 100,000 Section 8 rental vouchers. It would also mean using city dollars more effectively, which he says could be done by “breaking with 20-year-old preferences for reliance on private, for-profit developers who have little interest in developing affordable housing for very poor people” and instead working with non-profit developers. The Right to the City Alliance (RTTC), a national coalition with 10 New York City member organizations including Picture the Homeless, GOLES and FUREE, has a few national demands, but will continue to employ a “trans-local” strategy with the hopes that the threat of Trump will push local policymakers to work more closely with grassroots activists, particularly to implement RTTC’s demands for universal rent control and community control of land through the creation of community land trusts. RTTC organizer Tony Romano is hopeful: Tenant movements are experiencing an upsurge, with several California cities starting or strengthening rent control this November for the first time in decades. Furthermore, the threat of Trump is helping to break silos between different social justice movements, he says. This weekend, Right to the City will be participating in direct actions across the country in alliance with other grassroots groups. Organized under the banner “It Takes Roots to Grow the Resistance,” Romano says the new alliance is united in a push for low-income communities of color to control their own fates. But even if we can hope for progress on a local level, New Yorkers can’t afford to ignore housing problems outside city borders, says Laura Mascuch, director of the Supportive Housing Network of New York. Rural counties—including areas of upstate New York—depend on federal sources for a greater portion of their housing budgets, and their housing problems affect city residents, too: Nationally, homeownership rates are at their lowest in fifty years, which experts say is helping to drive up demand in the rental market, worsening the affordability crisis in cities. One election result analysis shows a correlation between negative home values and support for Trump. In other words, hiding in a progressive bubble while ignoring federal fights is probably not the answer, either. Here are 10 national housing battles in the hands of Congress and the White House that activists say could be worth following in the months to come. 1. Protecting HUD from the Ax: In recent years, HUD has been repeatedly subject to spending caps. Low-income housing advocates want those caps lifted and HUD’s budget increased to keep apace with rising fair market rents, but the Trump administration has called for an even greater cut to non-defense spending—a cumulative cut of one percent each year, or what would amount to a 30 percent cut to HUD’s budget by 2026, accounting for inflation. Advocates say such cuts would be detrimental to New York’s public-housing capital backlog, the availability of Section 8 vouchers and the provision of project Section 8 contracts. While Carson recognized at his confirmation hearing that rental assistance can be “life saving,” he also said he supports Trump’s annual one percent cut to non-defense spending, and wants to do more research before proposing a HUD budget. “I don’t know what the number is going to be, quite frankly. It might more, it might be less,” he said. 2. Defending Obama’s Progress on Fair Housing: To improve the implementation of the Fair Housing Act of 1968, which requires that governments work toward reducing barriers to housing and equal opportunity, the Obama administration developed a new rule, along with a set of implementation tools, that would help local governments assess the impacts of their policy decisions on combating housing segregation and discrimination. Republican lawmakers have argued Obama’s efforts are tantamount to social engineering and have introduced bills to outlaw the new program. Carson once called Obama’s fair housing program a “failed socialist experiment,” but at his confirmation hearing emphasized that he was only against “cookie-cutter” government programs, though how this statement applies to Obama’s program is unclear. 4. Opposing Work Requirements and Time Limits: In a policy brief released last June, House Republicans said HUD’s rental assistance programs “lack requirements to encourage greater individual self-sufficiency,” and called for work-requirements for work-capable households receiving rental assistance, as well as time-limits to benefits. Carson remained vague at his hearing about these policies, saying he saw the necessity of housing assistance to helping families move out of poverty, but also wanted to place “a little more time and effort developing the potential of our people.” Low-income housing advocates argue that such policy ideas are rooted in poor-shaming, disregard the fact that many people on rental assistance do work or are family caretakers, and argue that attaching such requirements to welfare in the 1990s did not eliminate, and in some cases worsened poverty. 5. Ending Subsidies for Rich Homeowners: Of the $200 billion* the federal government spends each year on housing aid, eight out of ten dollars goes to families earning more than $100,000 and four out of ten to families making more than $200,000. The biggest culprit for this regressive redistribution is the mortgage deduction tax program, which provides large tax breaks to wealthy homeowners. Housing advocates in the United for Homes Campaign seek revisions of the program that they say would shift the benefits of the tax credit to low-income homeowners while creating $241 billion in savings over the next ten years. There are signs that Republican lawmakers may be open to considering these reforms, but whether they will be willing to reinvest the savings in low-income housing programs is another question. 6. Reforming and Bolstering the Low Income Housing Tax Credit (LIHTC) program: This program, currently the federal government’s primary funding source for new affordable housing projects, allows local governments to sell tax credits to investors, generating funding for construction. Some low-income housing advocates like NLIHC and the affordable housing industry want to see an expansion of, and reforms to, the LIHTC program. Republicans have been friendly to LIHTC, and have worked with Democrats to introduce legislation that would expand the program. But Trump has also endorsed a House proposal to reduce the corporate tax rate from 30 percent to 15 percent, which could make investors less interested in buying tax credits and undermine the effectiveness of LIHTC. 7. Protecting Homeownership Opportunities: Freddie Mac and Fannie Mae are government-backed, for-profit private enterprises that buy mortgages and sell them to investors, which helps ensure a stable and ongoing supply of mortgage money for homeowners. During the mortgage crisis of 2008, the two giant enterprises nearly collapsed and were taken over by the federal government. Republicans, including several of Trump’s cabinet picks, argue that the government’s role in these enterprises places taxpayers at risk, and say that they should again be privatized to give other lenders the opportunity to compete with them. But a Wall Street Journal analysis suggests privatization would benefit Freddie and Fannie’s shareholders more than it would taxpayers, and some low-income housing advocates want to ensure privatization does not have negative impacts on homeowners and on the revenues of the housing trust fund. Carson has once again given mixed message on this front, saying he wants to lessen “government footprint” but also protect homeownership opportunities. 8. Saving At-Risk Homeowners from Private Equity: Following the 2008 mortgage crisis, HUD’s Federal Housing Administration, Freddie Mac and Fanny Mae began selling bundles of at-risk mortgages to hedge funds and private equity companies in an effort to bolster their hard-hit finances. But Right to the City and other advocates say that private buyers drive homeowners into foreclosure, then flip the properties to make a profit. (Private equity representatives dispute these claims, and HUD has made changes to the program in response to concerns.) Right to the City contends that these agencies should instead retain these homes as public assets or transfer them to community land trusts. 9. Bolstering Obama’s Local Hire Work: The Obama administration is in the process of revising the Section 3 rule, which requires local governments that take advantage of HUD funding to ensure 30 percent of workers are residents of HUD housing programs. It will be up to Carson to see through revisions to the rule, which would expand the requirements to more projects. 10. Ending Housing Discrimination Against Those with Convictions: HUD rules restrict people with criminal convictions from living in or even visiting public housing. Yet movements have been underway in many cities, including New York, to remove some of these restrictions. The Obama administration also released a draft rule last spring that forbids private property owners from throwing out a rental housing application simply on the basis of an applicant’s prior conviction. While criminal justice advocates hope to continue eliminating restrictive polices, Republican Speaker Paul Ryan has in the past opposed reform efforts. Correction: Originally we said the federal government spends $200 million on housing aid. The actual amount is $200 billion. City Limits coverage of housing policy is supported by the New York Community Trust and the Charles H. Revson Foundation. The post 10 Housing Policies to Watch Under President Trump appeared first on It Takes Roots to Grow the Resistance. Early Friday morning, social movements from across the country converged in numerous locations across Washington, D.C., including 14 different “security” checkpoints, to shut down, slow and disrupt the presidential inauguration of Donald Trump. From Standing Rock Indigenous water protectors to Movement for Black Lives organizers, activists locked down and staged blockades to delegitimize a ceremony for a figure who rose to power on a tide of white nationalism and neo-fascism. The large numbers took action in step with people across the United States and world. “I am in tears. I am so honored to have co-organized the ‘Communities Under Attack Fight Back’ block to uplift Muslim resistance, immigrant resistance, Jewish resistance,” said Darakshan Raja, founder of the Muslim American Women’s Policy Forum and co-director of the Washington Peace Center. “For now, a day that I was afraid of is giving me more power than ever,” said Raja. Sarah Lazare is a staff writer for AlterNet. A former staff writer for Common Dreams, she coedited the book About Face: Military Resisters Turn Against War. Follow her on Twitter at @sarahlazare. The post Rising Up and Shutting it Down: The Trump Inauguration Protests in Images and Quotes appeared first on It Takes Roots to Grow the Resistance. From January 18-21, 2017 organized the It Takes Roots to Grow the Resistance Delegation to Washington DC, plus several Trans-Local Actions happening across the country in the first 100 days of the Trump administration. The #ItTakesRoots to Grow the Resistance delegation was our response to the broader call to action in the face of the rising attacks under the incoming Trump Administration on the gains that people of color, women, immigrants, LGBTQ communities, and workers have fought for. This will have implications locally, nationally, and globally for years to come. Now is the critical time for a resistance movement to be visible and strong, on the defense and the offense. Click here to watch a recording of the reportback from our January delegation. The post January 2017 It Takes Roots went to Washington DC appeared first on It Takes Roots to Grow the Resistance. They tried to bury us. They didn’t know we were seeds. Women of color led the way. This weekend we all helped to build the largest mobilization against the inauguration of a President in the history of the United States! From DC to Los Angeles, Boston, Atlanta, New York, Oakland, to countless cities and towns across the country and around the world, millions of people took to the streets. While many of the marches drew broad participation from primarily white women of many ages, the majority of these mobilizations were multi-racial, led by women of color and gender non-conforming folks. #ItTakesRoots to #GrowtheResistance is an effort led by women of color on the frontlines of racial, housing and climate justice across the country, which brought together over 100 grassroots leaders in DC this past week to grow our resistance, and organized translocal actions in 8 cities on inauguration weekend. It is an outcome of years of organizing and relationship building across the Climate Justice Alliance, Grassroots Global Justice Alliance, Indigenous Environmental Network, and Right to the City Alliance. We came together as four national grassroots alliances immediately after the elections because we heard loud and clear from our membership that our priority in this next period should be to build a visionary opposition to the racist, misogynist and xenophobic politics and practices of Trumpism. The leadership of frontline communities in the historic mobilizations of this past week are a testament for what is to come. Within hours of taking office, President Trump signed an executive order to pave the way towards repealing the Affordable Care Act, and reinstated the global gag rule originated by Ronald Reagan in 1984 that prohibits US funding to any international organization that includes education about abortion in their reproductive health and family planning options. Today he signed executive actions to advance the Keystone XL and Dakota Access Pipelines–both of which have been the center of some of the largest environmental justice mobilizations in US history. This President is intent on destroying our bodies, our communities, and Mother Earth. We will not let it happen. Join us to Grow the Resistance. Our delegation to DC spent a day and a half together in training labs and strategy exchanges. Members shared models of 21st century Sanctuary Cities and rapid response collectives, discussed the connections between climate justice, gender justice, land, and housing fights, strategized around what a Just Transition will look like for our communities in this period, and trained each other on direct action tactics for strengthening our visionary opposition. In the final hours before the inauguration of Donald trump, we led a two-part action starting at the Department of Energy and ending at the Department of Housing and Urban Development calling out the incoming administration’s picks for both departments and demonstrating the kinds of policies we want them to put forth that represent community solutions. On January 20th and January 21st, the #ItTakesRoots women of color-led contingent was on the frontlines of resistance to Donald Trump’s inauguration at #DisruptJ20 and the historic Women’s March on Washington. The contingent of Black, Latin@, Asian, Arab, and Indigenous women and gender nonconforming people are leading grassroots voices and organizers for climate, housing, gender, racial and indigenous justice. The #ItTakesRoots delegation was supported by the Ruckus Society and the Center for Story-Based Strategy. On Thursday we supported an action by indigenous groups to protest outside a Trump gala with a flash round dance led by indigenous women and youth. On Saturday, we marched with our sisters from the National Domestic Workers Alliance and other allies to be one of the liveliest contingents with our songs, drums, chants and dance. You are not alone. We have your back and we need your support now more than ever. It Takes Roots to Grow the Resistance is our response to this moment. We are committed over the next 100 days to translocal actions around the country, to continued conversations on longer-term strategy, and to developing our sector to fight together. Follow Indigenous Environmental Network for updates on how to support the continued fight against the Dakota Access Pipeline and the Keystone XL pipeline, in the wake of Trump’s executive order. Host an #ItTakesRoots strategy session and rapid response collective action in your city or region to #GrowTheResistance. Contact Malcolm at Malcolm@righttothecity.org to get connected. Join us April 29 – People’s Climate Mobilization in Washington DC. The post They tried to bury us. They didn’t know we were seeds. appeared first on It Takes Roots to Grow the Resistance. Join Grassroots Global Justice Alliance, Climate Justice Alliance, Indigenous Environmental Network and Right To The City Alliance on February 8, 2017 at 4-6 EST / 1-3 PST for our call about historic #ItTakesRoots to #GrowTheResistance mobilization in D.C. and around the country and discuss next steps in the first 100 days to grow the resistance. Please fill out the form below to RSVP. Únete a Grassroots Global Justice, La Alianza de Justicia, Indigenous Environmental Network y Right To The City Alliance el 8 de Febrero a las 4-6 EST / 1-3 PST por nuestra llamada sobre la movilización histórica de Se Necesitan Raices para Cultivar La Resistencia en D.C. y en todos partes del país. Discutiremos los pasos siguentes en las primeras 100 días para cultivar la resistencia! Por favor llena la forma abajo para inscribirse. 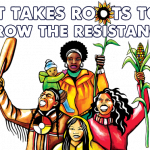 The post 2/8/17 – RSVP for: “Lessons and Next Steps from #ItTakesRoots to #GrowTheResistance” Call // Inscríbase aquí para llamada de: “Lecciones y Pasos Siguientes sobre Se Necesitan Raices para Cultivar La Resistencia” appeared first on It Takes Roots to Grow the Resistance. VISUALS: 75-foot banners, beautiful art, colorful signs. ACTION: Due to increasing threats on protesters’ safety at the J20 actions, staging details will not be revealed yet. WHEN: Saturday, January 21, 9:00 a.m.
WHERE: Meeting at Garfield Park (corner of 3rd and G Street SE), Washington, D.C.
WHO: The #ItTakesRoots contingent, led by women from communities most impacted by the new administration’s proposed policies. Thousands of women of color, domestic workers, leaders of immigrant rights and climate justice organizations and allies. Marching with: hundreds of Domestic workers and women in climate leaders from across the US, representing groups like: 350, Sierra Club, Amazon Watch, National Domestic Workers Alliance. WHY: The new administration poses tremendous threats to national parks, sacred land, water, our bodies and homes. Women of color and grassroots leaders are joining together to resist and to lead the way with solutions right now. The post Women of Color Lead With United Vision: Resist and Protect Each Other appeared first on It Takes Roots to Grow the Resistance. Women of Color protect the land, water, and housing for all of us. WHO: Hundreds of Indigenous peoples, leaders of climate justice movements, veterans, women of color and allies gathering to defend the land, water, bodies, and homes from tremendous threats posed by the incoming administration. WHY: The appointments of Rick Perry, Steve Mnuchin, and Ben Carson make clear the Trump administration’s intention to ramp up the exploitation of land for private profit, wreaking devastation for the climate, for our water, and for our homes. Until a week ago, Rick Perry was on the Board of the company driving the Dakota Access Pipeline, which threatened the water of 17 million people. Trump has signaled his desire to re-enter an arms race, leading to a greatly intensified risk of nuclear war and to increased health threats in indigenous communities and communities of color where nuclear testing occurs. Mnuchin, Carson, and Trump together will threaten the homes of both homeowners and renters. Mnuchin is known as the “foreclosure king” for the over 36,000 foreclosures he instigated during the financial crisis. With half of all renters facing unaffordable rents and evictions at all-time highs, Carson has stated that he plans to turn public housing over to private interests, which will only worsen the displacement and affordable housing crises faced by communities around the country. VISUALS: 75-foot banners, Indigenous women from Standing Rock, veterans, street theater to showcase threats posed by the Trump administration and what an alternative could look like – protecting the climate, land, and water for all people. The post Women of Color protect the land, water, and housing for all of us. appeared first on It Takes Roots to Grow the Resistance. The post It Takes Roots to Grow the Resistance Translocal Toolkit appeared first on It Takes Roots to Grow the Resistance. Washington D.C. | January 18, 2017 — This week, women of color and grassroots leaders from around the U.S. will join forces for the “It Takes Roots to Grow the Resistance” delegation to Washington D.C. to take action against the incoming Trump administration. The delegation, organized by the Climate Justice Alliance, Grassroots Global Justice Alliance, the Indigenous Environmental Network and the Right to the City Alliance, will bring together over 100 grassroots leaders from communities most impacted by a wide range of the incoming administration’s proposed policies. These leaders – from African American, Latino, Asian, Pacific Islander, Indigenous, and poor white communities across the country – are joining together to resist the threat posed by the incoming administration and to build a vision beyond hate and walls. “We are in a moment in which racial hatred against our communities of color is stronger than ever, in which we have to organize, unite and defend our rights that we have as immigrants, workers and families. We cannot allow fear to paralyze us. The respect and dignity of and in our communities is our shield to be able to maintain that strength and resistance in our communities.” – Sylvia Lopez, Domestic Workers organizer, Mujeres Unidas y Activas. These grassroots leaders will join together in workshops to learn from each other’s local struggles and victories and to be trained in community resilience and nonviolent resistance. They will also take part in the direct actions listed below. #ItTakesRoots direct action at the U.S. Department of Energy and the office of Housing & Urban Development to oppose Rick Perry’s direct ties to the Dakota Access Pipeline, and the threat to housing security posed by Ben Carson, Steven Mnuchin, and Donald Trump. #ItTakesRoots will spearhead a women of color, gender non-conforming folks and allies contingent at the Disrupt J20 March called for by local D.C. communities aiming to disrupt the inauguration. #ItTakesRoots will join in with the Women of Color & Allies Contingent for the historic Women’s March on Washington. Thousands are expected to join the contingent including members of the four alliances, the National Domestic Workers Center, 350.org and more. The contingent will feature frontline Women of Color spokespeople as well as bold and large art & banners. On January 20th, in solidarity with the delegation in D.C., member organizations are spearheading actions in nine cities across the country including: Chicago, Oakland, San Francisco, Nashville, Los Angeles, Boston, San Antonio, Long Beach and Denver. The #ItTakesRoots coalition also plans to escalate a series of translocal actions throughout the first 100 days of the Trump Presidency to build community power. Grassroots Global Justice is a national alliance of grassroots organizations building a popular movement for peace, democracy and a sustainable world. GGJ weaves and bridges together US-based grassroots organizing groups and global social movements working for climate justice, an end to war, and to advance a just transition to a new economy that is better for people and the planet. The Climate Justice Alliance is a collaborative of over 35 community-based and movement support organizations uniting frontline communities to forge a scalable, and socio-economically just transition away from unsustainable energy towards local living economies to address the root causes of climate change. We are rooted in Indigenous, African American, Latino, Asian Pacific Islander, and working-class white communities throughout the U.S. We are applying the power of deep grassroots organizing to win local, regional, statewide, and national shifts. Right to the City (RTTC) emerged in 2007 as a unified response to gentrification and a call to halt the displacement of low-income people, people of color, marginalized LGBTQ communities, and youths of color from their historic urban neighborhoods. We are a national alliance of racial, economic and environmental justice organizations. Established in 1990 within the United States, IEN was formed by grassroots Indigenous peoples and individuals to address environmental and economic justice issues (EJ). IEN’s activities include building the capacity of Indigenous communities and tribal governments to develop mechanisms to protect our sacred sites, land, water, air, natural resources, health of both our people and all living things, and to build economically sustainable communities. The post Women of Color Lead: A Call to Grow the Resistance against Trump, to Converge in Washington D.C. Jan 18-21 appeared first on It Takes Roots. GO TO STANDING ROCK and stand with the Indigenous-led water defenders on the frontlines. DONATE to indigenousrising.org or ocetisakowincamp.org to support the legal team and the ongoing infrastructure needs. DISRUPT BUSINESS AS USUAL at the Army Core of Engineers Offices in your local community and demand that they deny the permit to bore under the Missouri River. Demand a full Environmental Impact Statement be completed. The Indigenous-led struggle in Standing Rock, North Dakota against the Dakota Access Pipeline is a turning point in the climate justice movement. The proposed $3.8 billion Dakota Access Pipeline, if completed, would carry a half a million barrels of oil per day from the Bakken Oil Shale Fields. The route the pipeline would take lays under multiple bodies of water, including the Missouri River that supplies drinking and irrigation water that more than 10 million people depend on. What began with Oceti Sakowin youth running 2000 miles from North Dakota to Washington DC in April of 2016 has now grown into a powerful grassroots movement that is forcing an injunction against one of the largest pipeline projects in North America. The post 5 Things you can do to Stand with Standing Rock appeared first on It Takes Roots. For more background and detailed criticism of the agreement see We Are Mother Earth’s Red Line (LINK) a report released by the It Takes Roots Delegation to the United Nations Framework Convention on Climate Change (UNFCCC) 21st Conference of the Parties (COP21) in Paris. The We Are Mother Earth’s Red line national report coincides with the premier of the highly acclaimed Not Without Us film this week in San Francisco and Washington DC. Not Without Us follows seven multi-generational, grassroots activists from around the world as they head to the COP21 mobilizations in Paris. The “It Takes Roots to Weather the Storm” delegation brings together Grassroots Global Justice Alliance (GGJ), the Indigenous Environmental Network (IEN), and the Climate Justice Alliance (CJA) organized the delegation. During the UNFCCC 21st Conference of Parties (COP21) It Takes Roots mobilized more US and Canadian grassroots and Indigenous groups who took to the streets of Paris during the COP21, despite a ban on public protest—and amplified the pressure that Indigenous Peoples, civil society, and grassroots movements have built throughout the 21 years of UN climate talks. The post Statement on Paris Agreement Signing – International Alliance of Frontline Communities appeared first on It Takes Roots. Storms, Roots, And Seeds: Beyond COP21! The storm hurtled across the land, bringing the sea and everything with it. Trees snapped, houses washed away, vehicles became projectiles into second story windows, coconuts became cannon balls smashing bone and wood beams. My great grandmother’s cashew farm splintered in the salt and the wind. This particular storm was called Typhoon Haiyan and it hit the Philippines in November 2013 – the largest storm on Earth ever to make landfall at that time. The Philippines has still not recovered from the impact of Haiyan —or rather its government and the corporations it is beholden to are trying to militarize and privatize it. This year I was at work and another storm hit me right in the chest. The LA area Exxonmobil refinery a block away from where I grew up had an explosion that registered 1.7 on the Richter scale. A faulty fluid catalytic converter caused the blast and threw an 80,000 pound piece of equipment a hundred feet. Windows blew out and the sky filled with “ash”. I got on the phone and breathed again when I heard my mom’s uninjured voice, my dad was busy outside with a mask, watering the house down so nothing caught on fire—their vegetable garden ruined as sludge gray water loaded with heavy metals oozed over the front yard. As it stands, the COP21 agreement is brewing another kind of storm for communities on the frontline. World leaders converged to talk about greenhouse gas emissions in the parts per million, keeping up endless growth through a force of green consumers, and making sure polluters and their false promises can come along for the ride without losing any profits. Without long-term vision, accountability, and concrete steps to de-carbonizing all economies, we’re headed towards destruction that neither we nor this planet deserve. At the end of these talks much is being heralded about the US actually signing on to an agreement despite internal right wing pressure and climate deniers in Congress. There is a lot of talk about state-by-state innovations—including California Governor Jerry Brown pushing offsets agreements with regional partners. These steps are at best helping climate change become a daily conversation. At worst they are pushing for increased privatization, confiscation of Indigenous People’s lands, loss of cultural and biological diversity, and human rights violations. What we need now post-COP is bold action to keep fossil fuels in the ground, reject the fundamentalist ideology of globalization, a commitment to the well being of people over the profiteering of a few, and infrastructure and resource support for locally owned and controlled renewable energy solutions. Earlier this month, I traveled to Paris as part of the It Takes Roots delegation to build towards just that: a community rooted deeply in place, connected globally through solidarity, and that has the strength and know-how to weather all the storms that are yet to come. We know our communities have been on the cutting edge of true climate resiliency work for generations. We have always been the ones hit first and worst—and we’re still here and will continue to lead the transformative path towards a regenerative economy and a living planet. Community by community, we’re linking up to show our own solutions. At the Asian and Pacific Environmental Network, (APEN) we build leadership and power in the Asian American & Pacific Islander communities for bold action. Our members stand up to the largest stationary polluter in the state of California, educate legislators and neighbors on climate policy in six languages, and are working on building a living model of a just transition through community-owned solar power. APEN and the groups who are part of the It Takes Roots delegation are just some of the many grassroots organizations in the US doing the work necessary to change the system, build people power, and save our climate. Amazing solutions are happening all over the world too. In the Philippines—a country of over 7,000 islands and 175 languages in a portion of the Pacific known as “Typhoon Alley”—solutions are sorely needed. Salugpongan International is one network that speaks to the core of climate justice: supporting Indigenous People’s local initiatives to protect rights to the land and culture, of knowledge of place, and of education by the people for the people. A global movement—against war, against warming, for community rooted power—is growing. The indigenous people of the world deserve to thrive. The people of Richmond, California, deserve to thrive. Your community deserves to thrive. The COP21 process closed without real, durable and lasting commitments that bring us any closer to a cleaner, greener world—much less a more just one. But life goes on after the COP and so does grassroots organizing. So let’s feel our roots, keep an eye on where we can sprout and build the world we do deserve. Shina Robinson is a part of the It Takes Roots Delegation and works with the Asian and Pacific Environmental Network. The post Storms, Roots, And Seeds: Beyond COP21! appeared first on It Takes Roots. What’s hot and what’s not at Paris COP21: It Takes Roots In New Internationalist’s Hot List! In a provocative feature listing all that was hot and all that was not at the Paris COP21, the New Internationalist highlighted It Takes Roots in its hot list for “serving frontline fierceness inside and outside the COP. Slick production values for some very real people.” Read the full list! The post What’s hot and what’s not at Paris COP21: It Takes Roots In New Internationalist’s Hot List! appeared first on It Takes Roots. In their COP21 spotlight of the Dec 12 march, the widely watched independent news show Democracy Now! took to the streets of Paris and spotlighted a diverse array of activists and groups who came together for the final march to the Eiffel tower. Watch It Takes Roots delegates spotlighted in their COP21 special, including Sarra Tekola, Derek Mathews and Shawna Foster. The post Democracy Now! Interviews It Takes Roots Delegates appeared first on It Takes Roots. For decades the incinerator industry has been plaguing environmental justice communities worldwide. Now, rebranded as so-called “waste-to-energy,” this dirty industry is trying to position itself as a source of clean power. The US government, and many others, are using COP 21 to push for incineration as a solution to climate change. However, incinerators create very little energy— and a lot of climate and toxic pollution. To produce the same amount of energy, incinerators release even more carbon dioxide than coal plants. At the same time, the toxic air pollution from these facilities greatly harms local communities. In the United States, in cities such as Detroit in the state of Michigan, residents suffer from the health and environmental consequences of incineration. Community leaders like Siwatu Salama-Ra of the It Takes Roots delegation became involved in the fight against incineration out of love for her family, community, and city. In Detroit, asthma rates are three times the state average, and many members of Siwatu’s family suffer from this preventable disease. These rates are only exacerbated with every year that the incinerator remains open. After 23 years of climate negotiations, governments are no closer to meaningful action on climate change. “GAIA (Global Alliance of Incinerator Alternatives) will not stand for corporations pushing their agenda of greenwashing (false solutions) to combat climate change during these negotiations, the only solution is a zero waste solution” said GAIA delegate Mahyar Sorour from Minnesota Public Interest Research Group. To call out false solutions such as incineration, It Takes Roots and GAIA delegates protested on Wednesday, December 9th at the Ivry incinerator in Paris. We stood in solidarity with local community organizations – Collectif 3R and Zero Waste France – who are pushing for zero waste alternatives to incineration. The Ivry incinerator and others like it in the Paris region, are responsible for burning the majority of Paris’ waste. In fact, much of the waste currently being generated at COP 21 will be burned in nearby incinerators, leaving local communities to bear the burden of toxic and climate pollution. In addition to pushing back against false solutions via direct action, GAIA members from around the world demanded that our government leaders and the COP21 delegation confront industry lies and promote community-based solutions. We highlight the negative health impacts that incinerators impose on host communities and the environmental injustice this represents. We welcome the global consensus that carbon based pollution is driving dangerous climate change that cannot be ignored. We call for an end to climate finance for incineration. We urge all governments to remove the eligibility criteria for biomass burning in all renewable energy credits, benefits and subsidies. We call for investment in zero waste solutions to address impending climate threats. Co-Written by Molly Greenberg from Ironbound Community Corporation and New Jersey Environmental Justice Alliance and Ahmina Maxey from GAIA. Molly, Ahmina and Siwatu are also It Takes Roots delegates. To read the full GAIA declaration visit www.no-burn.org?utm_source=rss&utm_medium=rss. The post Incineration Is Not the Solution: Zero Waste for Climate Action appeared first on It Takes Roots. “I think for us, Grassroots Global Justice, Indigenous Environmental Network, and the Climate Justice Alliance as grassroots and impacted communities in the United States and Canada, I think our global leaders have failed us, and I think that’s what is clear is that they did not do an ambitious enough negotiation to really save the planet…” noted It Takes Roots delegate and national co-ordinator of Grassroots Global Justice, Cindy Wiesner, in an interview with Telesur News. Read the whole interview. The post Cindy Wiesner on Telesur News: “Our global leaders have failed us” appeared first on It Takes Roots. In their wrap up analyses of COP21, the New Internationalist shines a light on why despite the dismal failure of the #COP21 agreement, there maybe hope – thanks to a massive people-led mobilization for climate justice that refuses to back off – including It Takes Roots delegation. They write: “Indigenous representatives from the incredible It Takes Roots grassroots delegation opened the Paris demonstrations with a powerful healing ritual. Alongside other Indigenous and frontline representatives they held a series of events and actions throughout the fortnight, including a flotilla of kayaks challenging fossil fuel extraction. Read this inspiring analysis. The post New Internationalist: Why We Should Feel Positive About Paris appeared first on It Takes Roots. As impacted communities, we are deeply aware of the imperative of the climate crisis. Our waters are being poisoned from fossil fuel extraction, our livelihoods are threatened by floods and drought, our communities are the hardest hit and the least protected in extreme weather events. The climate crisis is a reality, but the COP21 Paris Accord is not based on that reality. The atmosphere within the COP21 meeting was one of business instead of saving Mother Earth. World leaders were in deep negotiations not over climate policy, they were in negotiations about commercialization of nature. The result is a Paris Accord that is based on a carbon market that allows developed countries to continue to emit dangerously high levels of greenhouse gasses through shell games, imaginary technofixes, and pollution trading schemes that simultaneously let big polluters to continue polluting and result in land grabs and violations of human rights and the rights of Indigenous Peoples. When Obama says we are doing out best, it is simply not true. From cap and trade in California, to the carbon trading requirements of the Clean Power Plan, the US came into Paris with a predetermined model based on false solutions and bullied other countries to jump on board. The commitments they made ignore the overwhelming historic responsibility as a leader greenhouse gas emitter, and are far too low to stop the burning of the planet. The COP21 agreement is a failure, condemning humanity to a slow and painful death. In imposing a market strategy, global leaders, particularly those in the US and Canada, are choosing a course of inaction that is blind to the stark realities of climate crisis. The Paris Accord failed humanity and now we have to take things into our own hands and push at all levels of government. We know that the extraction of fossil fuels must end completely by 2050 to keep the earth from warming more than 1.5 degrees. The Paris Accord will now be moved into implementation at the national, regional, and local levels and we need to be organized to remain vigilant around the demand to keep fossil fuels in the ground, because anything short of that equals destruction. We join the call for System Change, Not Climate Change because we know that the fundamental driving force behind the climate crisis is capitalism, and the very nature of the extractive economy as a whole. Climate justice is not only about the environment. It is tied to jobs, housing, poverty, migration, food security, gender equality, access to health care. System Change requires fundamental respect for human rights, particularly the rights of Indigenous Peoples, as well as the rights of Mother Earth. System Change requires that we reject the corporate driven, free trade and investment agreements and how that is linked to also harmonizing the trading regimes, and investment regimes, and trees, and nature itself. We are building new alternative economic models based on an internationalist strategy ofJust Transition toward renewable energy, cooperative economies, and community control. We will continue to resist extraction at the local level in all frontline communities. The post CALL TO ACTION: The COP21 Paris Accord Is a Massive Failure appeared first on It Takes Roots. On the big day of the march on December 12, Parisians and local activists joined forces with diverse global environmental justice organizations and activists who had converged in Paris for COP21. AJ+ crew followed the march and tracked down some of It Takes Roots’ delegates and live streamed-interviewed them in this hugely popular video. Watch and share this video posted on AJ+ Facebook. The post AJ+ Spotlights It Takes Roots Delegates At Dec 12 March appeared first on It Takes Roots. TruthOut Highlighted It Takes Roots Delegation’s December 10 Human Rights Day Action at the Peace Wall, and spoke to Jihan Gearon, one of our delegates: “…here have also been strongly led by people of color working to center environmental justice issues and calling out environmental racism, especially Indigenous peoples protesting the omission of Indigenous rights from the accord. A lot of the most pristine, biodiverse places that exist now are because Indigenous people live there; they protect those areas,” said Jihan Gearon, who is Diné, from the Navajo Nation in Arizona. She is the executive director of the Black Mesa Water Coalition, a part of the Indigenous Environmental Network. “And if the UN doesn’t protect us, then those places are just going to go away.” Read the full Article. The post Dec 10 Action Highlight In TruthOut: Combating the Climate Counterrevolution in Paris appeared first on It Takes Roots. Worcester Roots is a collective of youth and adult organizers whose mission is to create opportunities for economic, social and environmental justice.